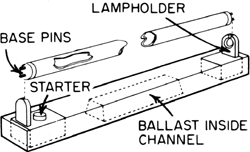 A low-pressure electric-discharge lamp; ultraviolet-light radiation is generated by the passage of an arc through mercury vapor; the inner surface of the lamp tube is coated with a phosphor which absorbs the ultraviolet and converts some of it into visible light. They are claimed to provide the same level of illumination as their fluorescent counterparts at only a fraction of the power consumption, and they have also been indicated to last about three times as long as comparable fluorescent tubes. The Greenstock lamp company has launched a first in the shatterproof market of affordable IEC standard T5 and T8 shatterproof fluorescent tubes. com)-- Great news for those looking to upgrade their T8 fluorescent tubes to LED—1000Bulbs. that's about twice the output per watt of the best fluorescent tubes currently on the market; he estimated the best LED lamps may get up to 120 lumens per watt. The $10 million plant has the capacity to recover and process the mercury, aluminium and glass from most of the 90 million energy--efficient light bulbs and fluorescent tubes disposed of each year in Australia, as well as mercury from the dental, medical, mining, defence and chemical industries. has launched the first product in a series of patented light emitting diode (LED) tubes that are designed to directly replace standard T-8 and T-12 fluorescent tubes. Safio's technology will be used to replace the entire range of traditional lighting, including incandescent light-bulbs and fluorescent tubes. The amenity, which will recycle household waste, including glass, aluminium, plastic, battery boxes, fluorescent tubes, gas and oil from across the Vale of Glamorgan, will be built at the Atlantic Trading Estate, in Barry. For instance, Philips Lighting in Eindhoven, the Netherlands, has developed a computer-controlled system that pairs fluorescent tubes that have different spectral outputs. reflect the fluorescent tubes that are hung vertically, of which there are more in White Light . Spencer Finch's lighting, from overhead colored fluorescent tubes, carves intimate space within the huge stage volume, then suddenly expands it to a vast field.